FREE APPRAISAL. To buy, sell or consign a Harry Houdini autograph or a Harry Houdini autograph letter signed, please email Nate@NateDSanders.com or call Nate D. Sanders at (310) 440-2982. Thank you. If you wish to sell your Harry Houdini autograph that is for sale, email Nate with a scan of your Harry Houdini autograph. Could be worth up to $5,000. 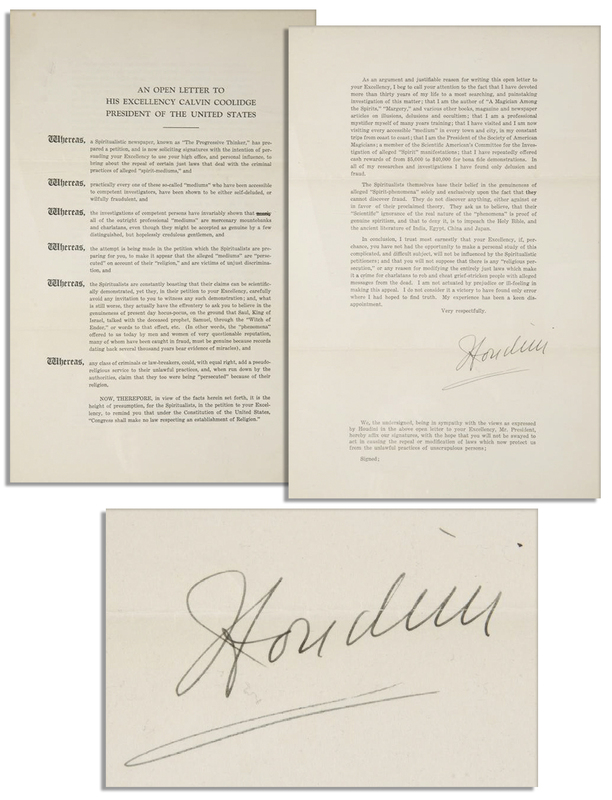 Harry Houdini autograph on a typed letter signed, ”Houdini”. Document is titled, ”An Open Letter to His Excellency Calvin Coolidge, President of the United States”. Houdini, an ardent debunker of phony mystics, writes to dissuade the President from relaxing laws against spiritualists in the District of Columbia. Letter dates to circa 1926. It reads in part, ”…any class of criminals or lawbreakers could, with equal right, add a pseudo-religious services to their unlawful practices and, when run down by the authorities, claim that they too were being ‘persecuted’ because of their religion…” Runs 2pp. on a single sheet, signed on verso. Measures approximately 25.75” x 8.5”. Near fine. Sold for $5,000. Harry Houdini autograph on a photo of Harry Houdini, famous magician & President of the Society of American Magicians, to “Mutiny on the Bounty” screenwriter and a founder of the Academy of Motion Picture Arts and Sciences Carey Wilson. 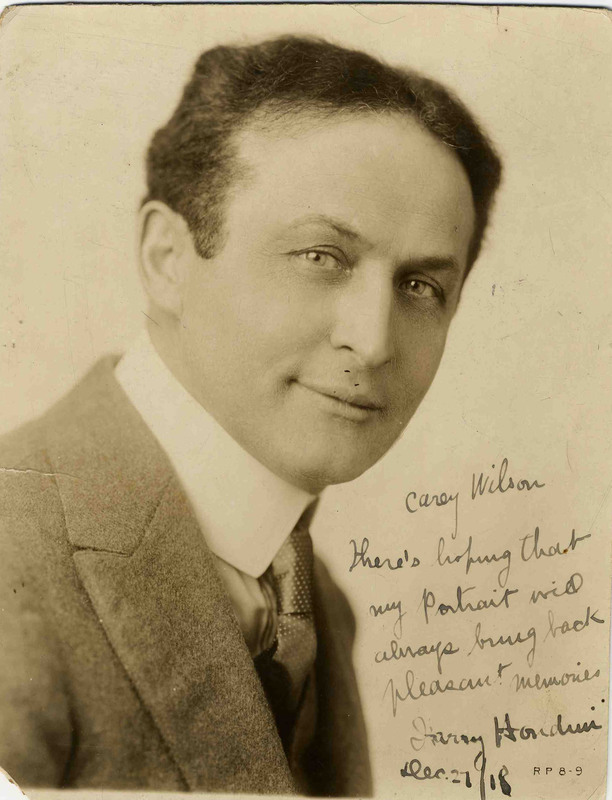 To the right of Houdini’s mischievous grin, inscription reads: “Carey Wilson / Here’s hoping that my portrait will always bring back pleasant memories / Harry Houdini.” Harry Houdini autograph signed photo. Dated 27 December 1918. Mounted on vintage advertising board (Liberty Tobacco), measuring 7″ x 9″. Photo is a light sepia tone head shot. Inscription and signature in black ink. Some soiling, tiny black spots to upper lip, one inch crease to left margin at Houdini’s shoulder, tiny paper loss to lower left corner, and light creasing. Overall very good condition. Sold for $2,279. 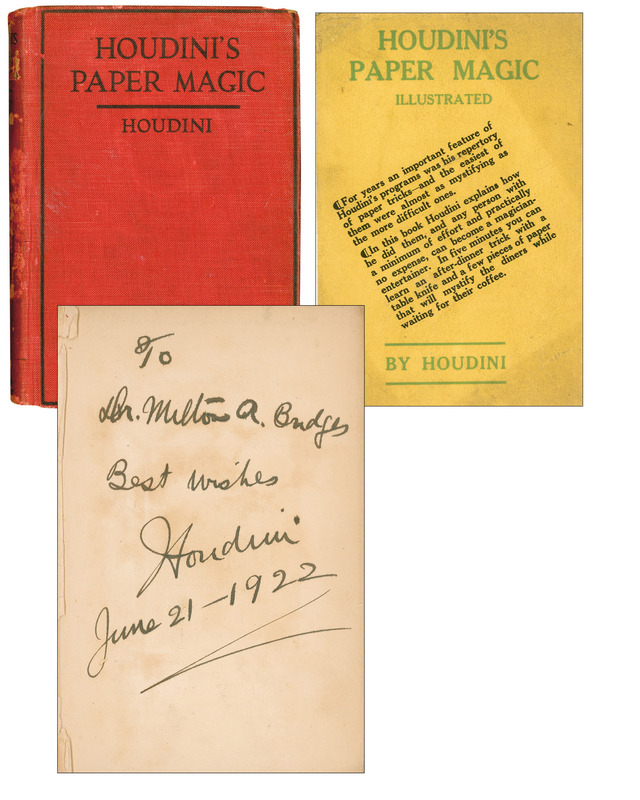 Harry Houdini autograph in his book: “Houdini’s Paper Magic.” New York: E.P. Dutton: 1922. First edition, first printing. Hardcover runs 206pp. Signed & inscribed in black ink to detached front free endpaper, “To Dr. Milton A. Budges / Best wishes / Houdini / June 21 – 1922.” Measures 5.5″ x 7.75″. First several pages detached, including signed page. Slight separation to boards & overall loosening to bind. Wear & soiling to boards & evidence of removed bookplate to front pastedown. Accompanied by unsigned later edition of the book. Good condition. Sold for $2,135. 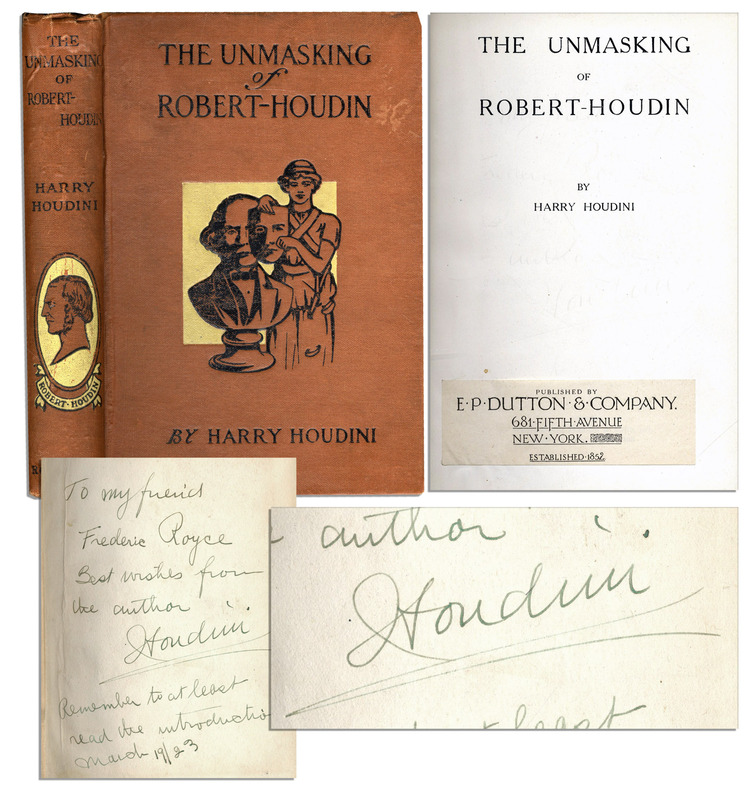 Harry Houdini autograph in his copy of ”The Unmasking of Robert-Houdin,” inscribed to Rolls-Royce co-founder Frederic Henry Royce: ”To my friend Frederic Royce / Best wishes from the author / Houdini / Remember to at least read the introduction / March 19/23”. Published by George Routledge & Sons, Ltd.: London: 1909. Rendered in green ink, autograph inscription covers the entire front free endpaper. The escapologist’s book is an attempt to expose his once mentor and namesake, Jean Eugene Robert-Houdin, for a fraud. Book features a photo portrait frontispiece of Houdini, with illustrated plates on nearly every page. Book runs 333pp. and measures 5.75” x 8”. Slight fabric loss to corners and wear to spine edges and hinges. Minor soiling to boards and toning to endpapers. In very good condition. Sold for $1,892. Master magician and escape artist Harry Houdini autograph on typed letter from 5 January 1922. Composed on letterhead form ”The Society of American Magicians”, where Houdini served as President, Houdini writes to a Mr. Richard Van Dien in full: ”Dear Mr. Van Dien:- [Mr. is crossed out in lieu of a first name] / Enclosed find copy of a registered letter received regarding registering ‘Growing a Girl’. Will you please bring this up for attention at the next council meeting. Regards, Sincerely yours, [singed] Houdini”. Houdini also pens a personal closing, though it’s unclear what he writes. Letter measures 8.5” x 11”. Light creasing and folds. Near fine condition. Sold for $1,719. 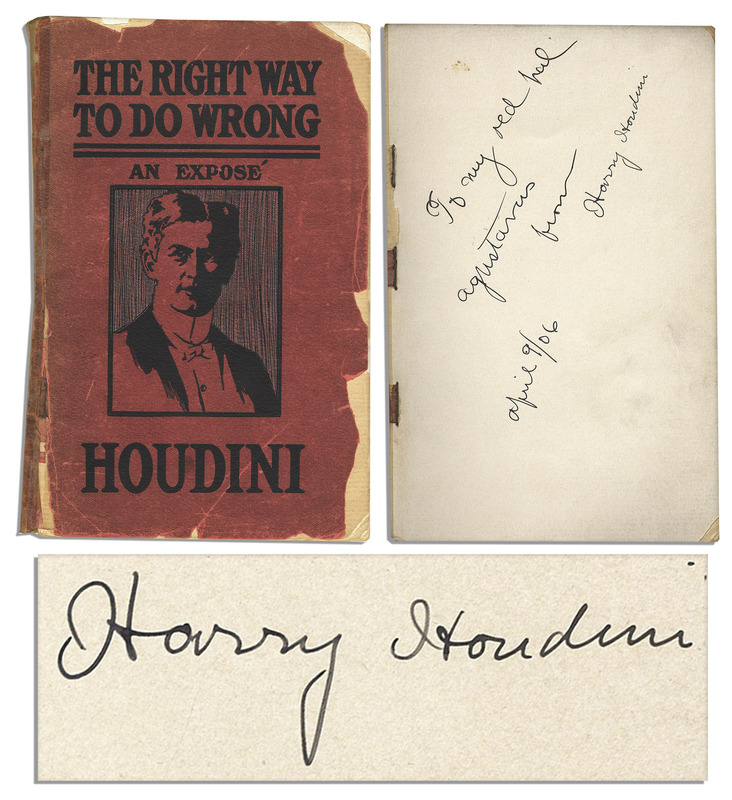 Harry Houdini autograph on his book: ”The Right Way to Do Wrong, an Expose of Successful Criminals”; first edition. The magician’s first book is self-published – Houdini: Boston: 1906. Houdini inscribes the front free endpaper in black ink, ”To my red pal Agustavus from / Harry Houdini / April 9/06”. Book is illustrated with sketch-style drawings, bound in red softcovers. Runs 95pp. and measures 5.5” x 8.5”. Absent rear cover and front cover shows chipping, secured with tape to spine. Very good condition. Sold for $1,250. 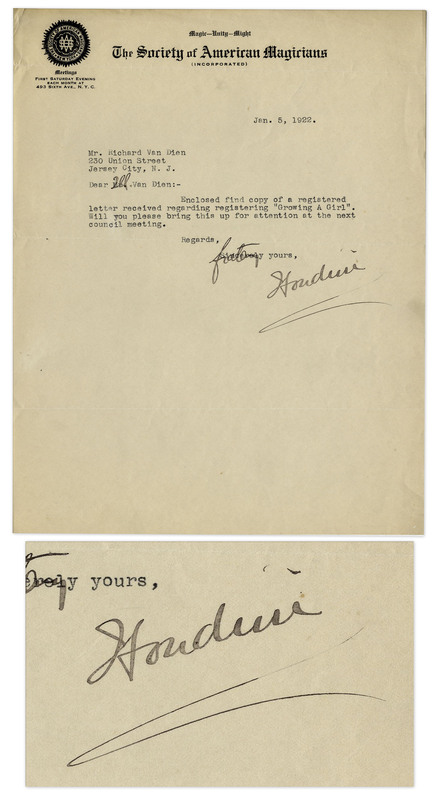 To buy, sell or consign a Harry Houdini autograph or a Harry Houdini autograph letter signed, please email Nate@NateDSanders.com or call Nate D. Sanders at (310) 440-2982. Thank you.